We arrived at Carr Taylor Wines on a warm Sunday afternoon. It was a beautiful day, with hardly a cloud in the sky. After checking in for our vineyard tour and wine tasting at their cellar door we were shown to a sun-kissed terrace, where a handful of other people were sat around wooden picnic tables (the kind you would find in a traditional pub garden) happily chatting while waiting for the rest of the guests so the tour and wine tasting could commence. The terrace area was absolutely beautiful, an old rustic farm house to the side, the cellar door in front of us, and just fields of vines as far as the eye could see. Once everyone had turned up, about 40 people in total I believe, the tour guide led us away from this beautiful spot, into the shade of a huge oak tree and proceeded to tell us the history behind the vineyard; how it has become what it is today, a short background on some of the vines grown here, and how this ends up as wine – from Vine to Wine! The vineyard, set on a 37 acre site, about 6 miles north of Hastings, was founded in 1971 by David & Linda Carr Taylor. The vineyard has small hills to the south and is almost completely surrounded by trees, providing shelter for the vines. This combined with the rich clay/ore soil found in the area, and the vineyard sloping slightly towards the South-East, creates the perfect growing conditions for the varieties of grapes which Carr Taylor grow. 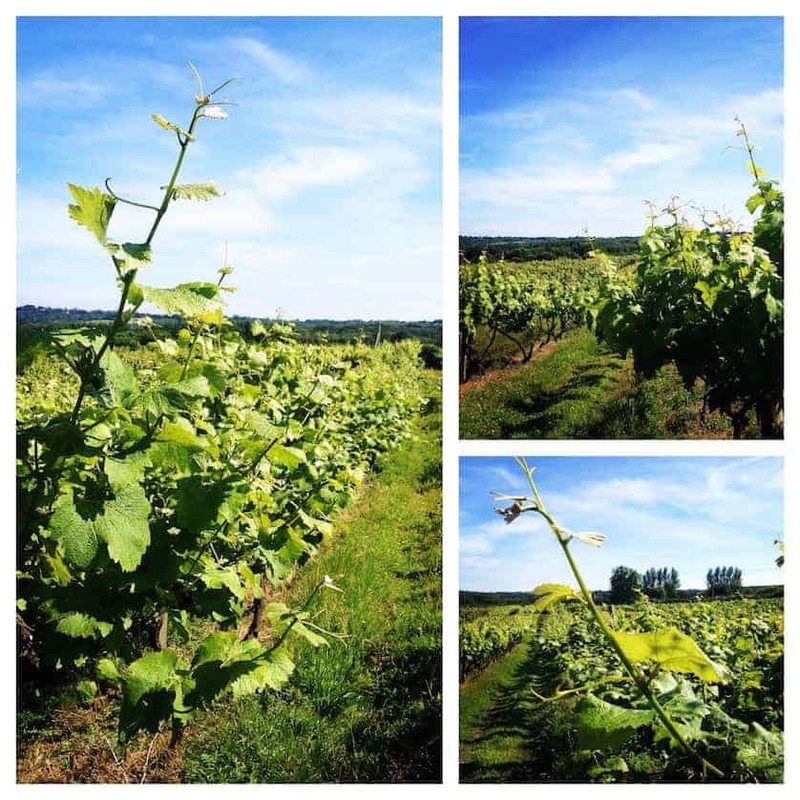 They grow over 12 varieties of grape, which produce crisp, fresh, aromatic wines that are distinctively English. As well as their still wines, they also produce a number of fruit wines, and also their award-winning ‘traditional method’ sparkling wines. In fact they were the first commercial vineyard in England to do so, starting back in the 80s. There are numerous trellising methods used when growing vines, with each variety of vine suited to one particular trellising method. Carr Taylor uses the Geneva Double Curtain method for the majority of their vines. This method has some important benefits: brings the main trunk and crop zone up to about 5 feet from the ground, resulting in a bigger plant which can draw more goodness from the soil. It also makes picking and pruning easier as the main crop zone is at eye-level. From the vineyards, we made our way to the 100 year old converted farm buildings, where they press the grapes, and store the juice. The juice is kept in approximately 25 fermentation and storage tanks. The storage tanks are fibreglass, which were bought in Germany in the 80s, and are very different to the Aluminium ones that you see at more recently established vineyards. From here we visited the bottling room, and although the machines were not bottling the wine during our visit, we were shown all the machinery and given a brief description on the role each piece plays in the wine-making process. The final stop was the tasting room for our wine tasting. Upstairs, above the cellar doors, was a room laid out with tables and chairs with wine lists at each seat. The wine list was packed with information about all the wines currently available, as well as wines which are unavailable until the new vintage has been produced. In the tasting room we had three samples of wine (you could have more downstairs in the cellar door afterwards if there was something else you wished to try). The first wine that we sampled was the best in the house, their sparkling Rosé (made in the same way as Champagne). We were all given a glass, but were told not to drink it yet. Our first instruction was to smell the aroma that was emanating from the stationary glass. Once we had all done this we were told to swirl the wine around in the glass, then smell again, taking a deep breath and inhaling all the aromas. You really could notice the difference. The swirling action seemed to bring the wine to life, and the glass was now bursting with different aromas. Now it was time to taste the wine. We were all told to take a small sip of the wine, hold it in our mouths and swallow. We were told this was to clear our pallet of any tastes that may have been lingering, ready for the next sip. Their sparkling wine was beautifully creamy and soft, unlike some sparkling wines which can have a harsh taste. The next wine was their aptly named 1066 English White wine. I am much more of a Red wine drinker, but this was a very pleasing white, easy to drink on its own or with a meal. Lastly we were offered a choice of their Cherry wine, or their Mead (I tried both!). The cherry wine was delicious, and it would be a lovely wine to enjoy on a summers day lazing in the garden or perhaps after a meal. Although I am not very keen on Mead I did want to try Carr Taylor’s Mead, and I was pleasantly surprised. It was much nicer than the mead I have tried in the past, a nice balanced drink, and not to overbearing on the honey. The tastings were followed by a short question and answer session after which you were invited to go back downstairs and peruse the cellar door. We were offered additional wine tastings here if we wished, and I couldn’t resist trying their Ginger wine. Apart from their own cellar door and online shop, they only supply their wines to a few local stores. This element of exclusivity is a bit of a shame as these wines are far too nice, and English, to be so restricted. For people that have visited the vineyard, they will be aware of the online store so they can purchase some more wine in the future, but for those who haven’t had the opportunity to visit they just wouldn’t know these superb wines even existed. I left with a box of treats, which included a bottle of their sparkling white, a few bottles of their 1066 as well as a few bottles of their cherry wine and ginger wine. 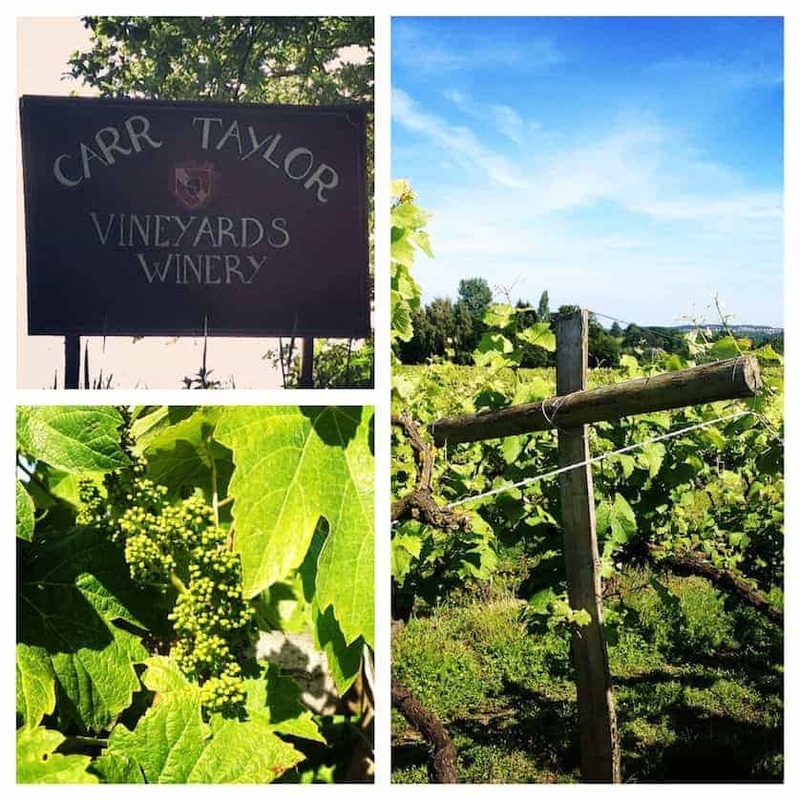 I would highly recommend a visit to Carr Taylor wines, as it makes a perfect weekend day out, provides an insight into wine-making and a chance to sample the goods. What more could you want, apart from guaranteed good weather?